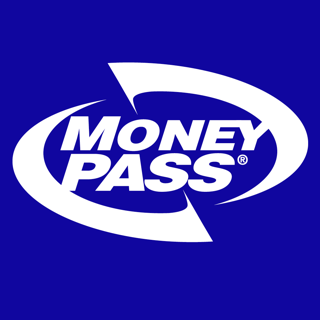 Your mobile solution to easily access your credit card account on the go. 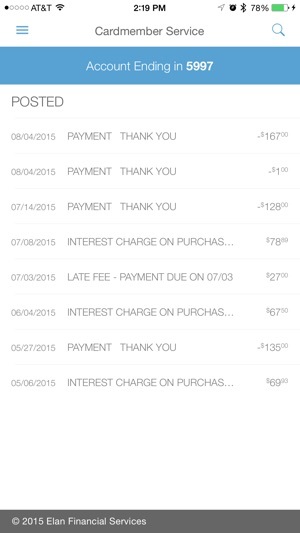 Easily use this app to review your transaction history on your phone. 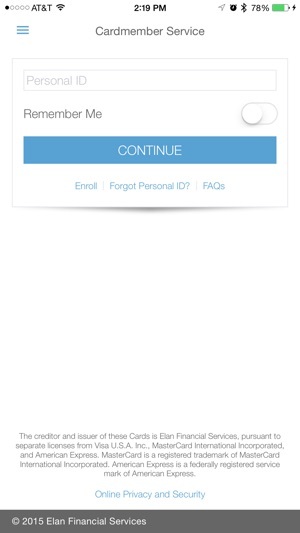 To get started simply download the app and log in using your Cardmember Service’s Personal ID and Password. If you are not enrolled in Cardmember Services, go to www.myaccountaccess.com to setup your login information. 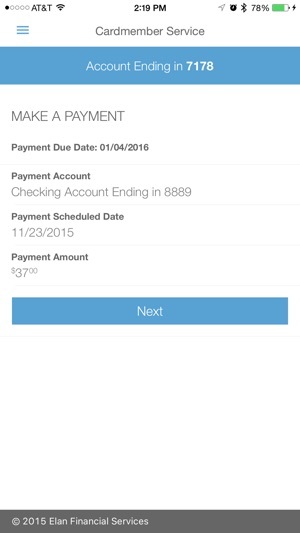 The Elan Financial Services Elan Credit Card Mobile app is free to download. Your mobile carrier may charge access fees depending upon your individual plan. Web access is needed to use the Mobile app. 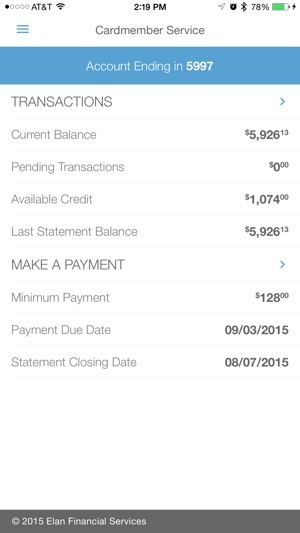 Check with your carrier for specific fees and charges. Some mobile features may require additional online setup. Updated verbiage for TouchID to distinguish between FaceID and TouchID. I do like how streamlined the app is; however, even though I’ve had Touch ID enabled ever since it was added to the app I always need to type in my password. And what’s more frustrating: I have to answer one of my security questions every time I make a payment even if I have just done so to log in. I’ve had a few information security classes and that just doesn’t make sense. If I’ve already answered a question to prove who I am the I shouldn’t need to do it again within the same session. But what drives me crazy is the fact that Touch ID doesn’t work at all, at least on my device. Obviously, if you’re already using this app you have very little choice on whether or not you use it. There isn’t an alternative for managing your credit card. Partly due to how bad this app is, I have opened another credit card account with a financial services company much better equipped to make an update an app. I like this app, it is continuously updated, though behind the times. It is SIMPLE and not unbearable with too many features. I like it for what it’s for... viewing transactions and paying my bill. I’ve never had a problem with this app. Some can say the logon process with TouchID is frustrating, though I like the extra layer of security. I’m glad that I feel secure with this app. The only suggestion I have right now is that I wish I can redeem my cash back rewards in the app. For this, I’m required to go onto the mobile site or desktop. If this was added, the app would be almost perfect! I love Élan, they’ve treated me well 100% of the time. Horribly written app that's going to require you to input your password each and every time even though it's supposed to support iPhone 7 TouchID. Additionally, if you happen to set up as one of your security questions a birth date in the format of MMDDYYYY the app only recognizes 2 digits for the year and you get locked out of your account . . . and I mean locked out of your account, not just on the app, but online using a browser as well. To add further insult, you have to call their customer support line to regain access to your account, and it involves wading through automated "concierge" menus, repeatedly having to input your card number, birth date, and so on. I'm so fed up with this presently I'm thinking about just cancelling the entire credit card as well. Don't waste your time with this app! © 2019 Elan Financial Services, Inc.